Hey my name is Gordon and I am currently a technical specialist at RheoSense, Inc. I also am currently overseeing the mid-west territories as well as New York & Pennsylvania. A little about myself: I have a background in Biophysics, and before joining RheoSense I worked in the formulation lab at a pharmaceutical company in the bay area. 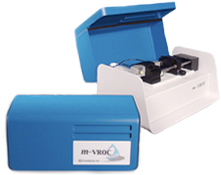 Before, I've struggled with developing reliable protocols on rotational rheometers until discovering the RheoSense m-VROC and liked it so much I decided to join the company. When I'm not working to help labs develop better protocols, finding ways to measuring viscosity faster & more accurately, I can be found painting outside, or sculpting whimsical pottery. If you have any questions feel free to shoot me a call or email. What is your favorite RheoSense instrument to use & why? My personal favorite is the m-VROC because it is so much easier to use than the cone & plate for my samples. Also the wide range of shear rates is definitely a huge plus when measuring a variety of samples. What are some of the things that you enjoy doing? I enjoy painting and sculpting every chance I get. Also I'm a huge fan of reading and exploring new experiences. You can reach me directly via phone or email, I respond quickly to both. My office phone is (925) 866-3801 ext. 1018.